The process of making a mural includes a lot of preliminary work, starting with a consultation with the client, reviewing location and theme. This initial meeting is followed by a back and forth, with both parties generating ideas. Then through sketches and quick studies a final composition is rendered in black and white, and then one in color. 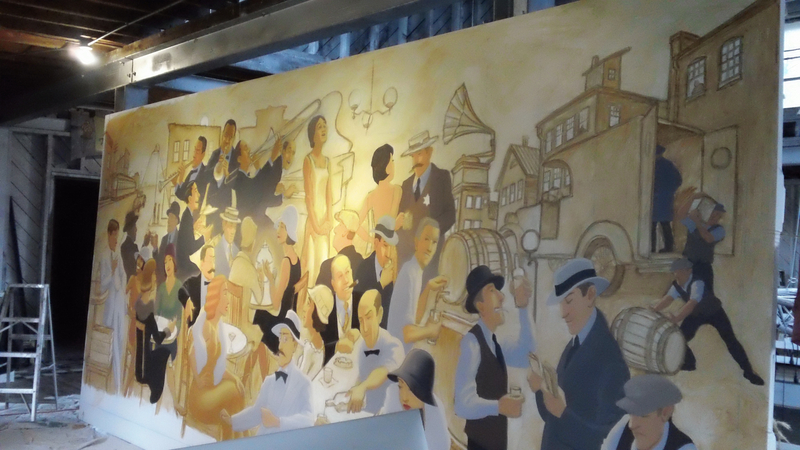 The design of the mural at William Jeffreys Tavern in Arlington, Va. came out of the restaurant owners desire to bring in the history of the location, and refer back to the time of prohibition. Tom researched and sketched from a lot of old photos of that era, and specifically looked at old images from the area near Columbia Pike and Old Arlington. 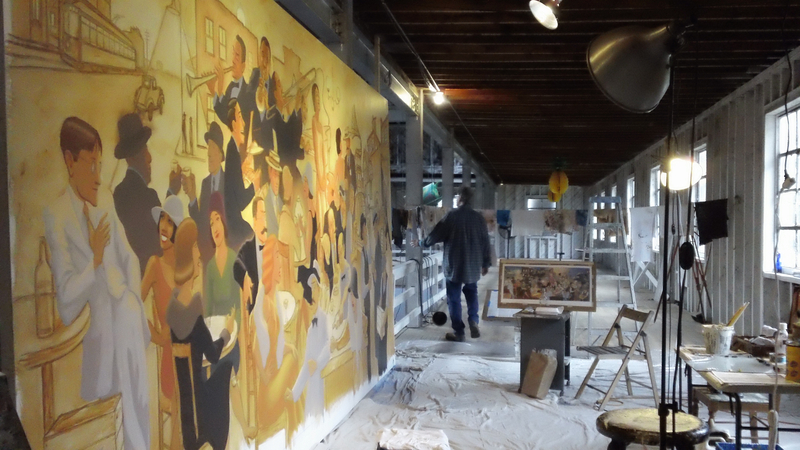 Depending on the surface and location, the mural will either be painted directly on location or painted off site on canvas, and then installed later. 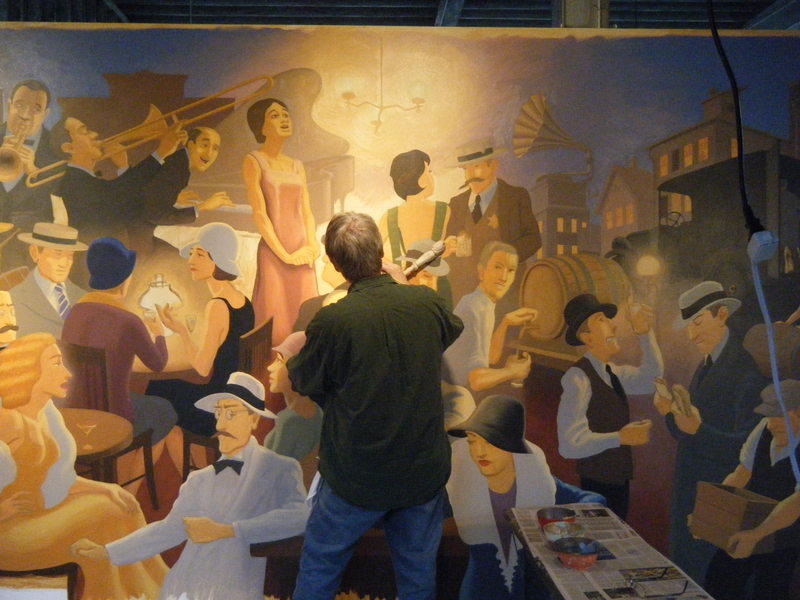 Because of the detail and length of time necessary for this mural, Tom decided to paint it in the studio. He constructed a frame, stretched and primed the canvas, and then transferred the drawing using a grid. Once the painting was finished we had a little party in the studio to celebrate, then the next day Tom rolled it up and drove it to it’s future home. Using professional hangers, the painting is prepared for the wall, then with several guys working together, the painting is lifted up and placed, and using wallpaper hangers tools, the painting is flattened out. Lastly, the edges are trimmed, and voila, the mural is done.